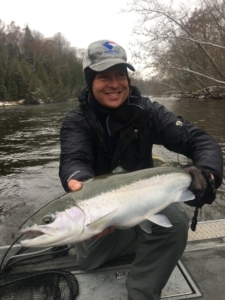 Scott with a very fast, acrobatic and powerful Muskegon river fall steelhead that we got to the net after quite a battle…. 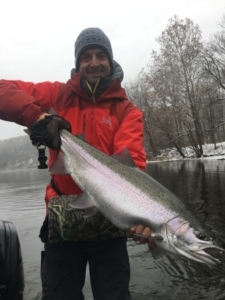 The Muskegon river north of Grand Rapids is amidst its annual fall/early winter steelhead run and will be through the remainder of 2018. We’re pursuing these wonderful lake Michigan big game fish with both fly fishing and light spin tackle equipment and fishing with various methods to tie into some “chrome” ! Due to some very odd weather over the last near 2 months, we’ve seen the river go from low and clear, to up a bit in level and with a nice tint to the water for a couple days, only to have the river drop again and clear back up. Click HERE for current Muskegon river water flow data. Josh came to west Michigan from NC to tie into some fall steelhead…and did ! We’re into some early winter snow fall now, but it looks like we’re in for a short spell of warmer weather on the way. Click HERE for current weather information. Although we don’t have the numbers of fall steelhead we’re accustomed to seeing in the river at this time of mid November, there are “some” big ones swimming around ! Present water temperature is in the 42-43 degree range in and around the Newaygo area.